Maryland's location in the U.S.
Kent County is a county located in the U.S. state of Maryland. As of the 2010 census, its population was 20,197, making it the least populous county in Maryland. Its county seat is Chestertown. The county was named for the county of Kent in England. The county is located on Maryland's Eastern Shore. In 1642, the governor and council appointed commissioners for the Isle and County of Kent. This act appears to have led to the establishment of Kent County. In 1675, the first county seat was New Yarmouth. The seat was briefly moved upriver to Quaker Neck, and then to the site of modern Chestertown. Before the American Revolution New Town on Chester, now Chestertown, was a port entry for the counties of Cecil, Kent, and Queen Anne's. The county has a number of properties which are listed on the National Register of Historic Places. In 1793, the county had its first newspaper, called Apollo, or Chestertown Spy. It was succeeded by local papers such as the Chestertown Gazette. Washington College, the oldest college in Maryland, is located in Kent County. According to the U.S. Census Bureau, the county has a total area of 413 square miles (1,070 km2), of which 277 square miles (720 km2) is land and 136 square miles (350 km2) (33%) is water. According to the Maryland Geological Survey, the highest point in Kent County is 102 ft above sea level, approximately 2.25 mi west of Coleman's Corner (shown on maps as "Coleman"), just northeast of the mouth of Still Pond Creek. Kent County is the smallest county in Maryland. It has a 209-mile shoreline, including Eastern Neck Island. The Chesapeake Bay is on the west, Sassafras River on the north, and the Chester River on the south. The eastern border with Delaware is part of the Mason–Dixon line. As of the census of 2000, there were 19,197 people, 7,666 households, and 5,136 families residing in the county. The population density was 69 people per square mile (27/km²). There were 9,410 housing units at an average density of 34 per square mile (13/km²). The racial makeup of the county was 79.64% White, 17.41% Black or African American, 0.15% Native American, 0.54% Asian, 0.05% Pacific Islander, 1.04% from other races, and 1.18% from two or more races. 2.84% of the population were Hispanic or Latino of any race. 15.7% were of English, 14.2% German, 12.4% Irish and 11.3% American ancestry. There were 7,666 households out of which 26.30% had children under the age of 18 living with them, 51.70% were married couples living together, 11.10% had a female householder with no husband present, and 33.00% were non-families. 27.80% of all households were made up of individuals and 13.70% had someone living alone who was 65 years of age or older. The average household size was 2.33 and the average family size was 2.81. In the county, the population was spread out with 20.80% under the age of 18, 10.90% from 18 to 24, 23.70% from 25 to 44, 25.30% from 45 to 64, and 19.30% who were 65 years of age or older. The median age was 41 years. For every 100 females there were 91.90 males. For every 100 females age 18 and over, there were 88.90 males. The median income for a household in the county was $39,869, and the median income for a family was $46,708. Males had a median income of $31,899 versus $24,513 for females. The per capita income for the county was $21,573. About 9.30% of families and 13.00% of the population were below the poverty line, including 17.00% of those under age 18 and 8.50% of those age 65 or over. As of the 2010 United States Census, there were 20,197 people, 8,165 households, and 5,272 families residing in the county. The population density was 72.9 inhabitants per square mile (28.1/km2). There were 10,549 housing units at an average density of 38.1 per square mile (14.7/km2). The racial makeup of the county was 80.1% white, 15.1% black or African American, 0.8% Asian, 0.2% American Indian, 1.9% from other races, and 1.8% from two or more races. Those of Hispanic or Latino origin made up 4.5% of the population. In terms of ancestry, 18.7% were English, 18.7% were German, 15.5% were Irish, 7.9% were American, and 5.8% were Italian. Of the 8,165 households, 24.4% had children under the age of 18 living with them, 49.2% were married couples living together, 10.9% had a female householder with no husband present, 35.4% were non-families, and 29.6% of all households were made up of individuals. The average household size was 2.29 and the average family size was 2.78. The median age was 45.6 years. The median income for a household in the county was $50,141 and the median income for a family was $63,507. Males had a median income of $41,046 versus $35,161 for females. The per capita income for the county was $29,536. About 5.1% of families and 12.2% of the population were below the poverty line, including 14.9% of those under age 18 and 7.8% of those age 65 or over. The newspaper of record is the Kent County News. Kent County Public Schools were some of the last in the country to fully integrate, but this was because of construction delays in opening the desegregated high school, which opened in the fall of 1969. Primary grade feeder schools in the Kent County system were integrated before the opening of the centrally located high school. Kent County, Maryland, is one of the few counties in the United States to border its namesake in another state—in this case, Kent County, Delaware. In 1790 Kent County contained the centre of population of the United States, according to the US Census Bureau. 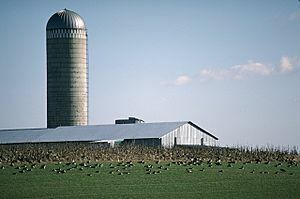 It is on the edge of a cornfield at 39.16.30 N 76.11.12 W.
Kent County, Maryland Facts for Kids. Kiddle Encyclopedia.